Come run in the capital of Virginia and see for yourself why we’re a Travel + Leisure Top Destination! Each of our scenic courses showcases some of our city’s favorite attributes. With street art, river views, historic architecture, and beautiful parks, our race routes treat runners to a unique and unforgettable tour of RVA that ends with our renowned downhill finish and CoStar Post Race Party on the riverfront! During your race, you’ll also encounter live bands, DJs, spirit groups, and Party Zones that will offer plenty of encouragement and motivation. Need an extra burst of energy? We have you covered with junk food stops, wet washcloths, and pickle juice! Once you cross the finish line, you’ll be greeted by a well-earned celebration on Brown’s Island complete with pizza and a Sierra Nevada beer on the house! DID YOU KNOW? 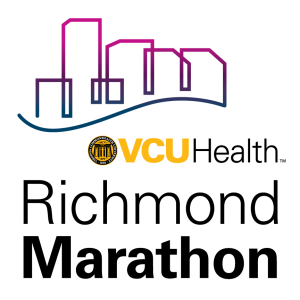 The VCU Health Richmond Marathon is one of the top 25 races most frequently used by runners wishing to qualify for the Boston Marathon! THERE IS NO RACE DAY PACKET PICK UP! Note: A $50 donation to Kids Run RVA (our official event charity) will automatically reduce your race entry fee by $20. The VCU Health Richmond Marathon is proud to be one of the most frequently used races to qualify for the Boston Marathon! With street art and river views, historic architecture and beautiful neighborhoods, the marathon course treats runners to a unique and unforgettable tour of RVA that ends with a grand finale finish line and post-race party on the riverfront! Check out our training solutions! Need help preparing? We offer in-person and virtual training teams to help you get to the finish line and reach your goals! You’re running Richmond!! Let us roll out the red carpet for you, and add that one-of-a-kind touch to your race experience. You’ve trained this hard, now it’s time to take it easy and run in style. Go ahead, you deserve it! All finishers can redeem a free certificate to recognize and commemorate their accomplishment. Mile 7 by 9:45 a.m.
Mile 11 by 10:50 a.m.
Mile 16 by 12:10 p.m.
Mile 20 by 1:15 p.m. Overall awards are determined by clock time; age group awards by chip time. Cash awards go to the top five overall finishers, male and female. Additional awards will be presented to the top five in all age groups in all races. Age groups for the marathon are are: 19 & under, 20-24, 25-29, 30-34, 35-39, 40-44, 45-49, 50-54, 55-59, 60-64, 65-69 and 70-74 and 75 & up. The Awards Ceremony for overall winners in each race will take place on Brown’s Island in the Finish Festival area soon after they have all completed the race. Age group winners will be notified by email on or about Tuesday, Nov. 26, with instructions on how to redeem their personalized award. Participants in the marathon will be corralled for the start based on predicted times listed on their completed entry form. The marathon begins at 7:45 a.m. sharp. Note: Start Corrals and race start time are subject to change. *Racing wheelchair participants, please email Sportable to coordinate your starting corral position. Already registered? You can confirm your entry here. Entry fees are non-refundable; race numbers and entries cannot be transferred to another person. No exceptions. If you are already signed up for one race and want to switch to another and assuming the race you want to switch into has not reached capacity, you may do so online through October 31 or in person at the Race Expo. There is a $10 fee to do so, along with any applicable entry fee difference. The age minimum to register for the VCU Health Richmond Marathon is 16 years of age on or before race day. Entry fees are non-refundable; race numbers and entries cannot be transferred to another person. No exceptions. This means once we have received your entry, you will not receive a refund if you cannot participate, and you may not give or sell your number or timing tag to anyone else. Anyone found participating with another person’s number will be disqualified and both people will be barred from future Sports Backers events, including the Ukrop’s Monument Avenue 10k and VCU Health Richmond Marathon. There will be no refunds and no transfer of entries from person-to-person. You may switch between the three events (8k, half and full) for a $10 fee plus the difference in entry fee at the time of the switch. If you are already signed up for one race and want to switch to the other, you may do so online through October 31 or in person at the Race Expo, provided the race you are switching to has not reached its capacity. The distance of the event you are switching to/from is a non-factor in determining what you will owe when you switch events. The determining factors are what you have already paid and the current price of the event you are switching to. If you have already paid more than the current price of the event you are switching to, you will only owe the $10 transfer fee. If you have paid less than the current entry fee of the event you are switching to, you will owe the difference in what you have paid and the current entry fee + the $10 transfer fee. You will not receive a refund of any entry fees. PLEASE NOTE: If you deferred your race entry from 2018 to 2019 and would now like switch distances, you must email [email protected] or call 804-285-9495 x250 in order to process the switch. EXAMPLE: If you registered for the half marathon for $75 and then want to switch to the 8k when its entry fee is $30, you would only pay the $10 transfer fee. EXAMPLE: If you registered for the marathon for $85 and would like to switch to the half marathon in July when the half’s entry fee is $95, you will owe $20 ($10 difference in entry fee + $10 transfer fee). To begin the switching process, click here and follow the prompts. Still have questions or trying to switch between one of our training teams? Please e-mail [email protected]. You may defer your registration from the 2019 VCU Health Richmond Marathon, Markel Richmond Half Marathon or Richmond 8k to the 2020 event. You may only defer to and from the same event: 2019 8k to 2020 8k, 2019 Half to 2020 Half or 2019 Full to 2020 Full. Deferred registrations may not be transferred to another person. Refunds will not be issued under any circumstances. The fee to defer a registration is $10 for the 8k and $20 for the half or full marathons through August 31 and then $20 for the 8k and $30 for the half or full marathons from Sept 1 – October 31. All deferrals must be done by October 31, 2019 and may be used only for the 2020 event. You may only defer an entry once (i.e., if you deferred your 2018 entry to 2019, you will not be able to defer it again in 2019 to 2020). There will be no deferrals at the race expo. Please note: Deferrals do not apply to training team registrations. To begin the deferral process, click here and follow the prompts. Still have questions? Please e-mail [email protected]. To edit any of your registration information, click here for instructions. If you need to change information other than is listed above, please e-mail [email protected]. Double your money! Bonuses are offered for course records for both male and female athletes. Bonuses of $500 will be awarded marathoners that finish under a certain time. There is no available travel and accommodations for the Markel Richmond Half Marathon and Richmond 8k. Please note: Plaques will be awarded to the top three local male and female finishers in the Markel Richmond Half Marathon and Richmond 8k. Richmond-Area Marathon Championship prize money and plaques will be mailed after the event.